Ron opened this week’s message with this question. Scripture is full of the Jesus’ mandate to love each other. In Mark 12:31, He tells us that after loving God, there is only one other commandment: “Love your neighbor as yourself”. In John 13:34-35, He tells us, “A new command I give you: Love one another. As I have loved you, so you must love one another. By this everyone will know that you are my disciples, if you love one another“. And in Matthew 5:44: “But I tell you, love your enemies and pray for those who persecute you, that you may be children of your Father in heaven”. And in John 15:12, Jesus says, “My command is this: Love each other as I have loved you”. This is by no means an exhaustive list, but we get the idea. Jesus was pretty clear. We are to love one another. We have to become vulnerable. It requires removing conditional barriers. Some have never experienced authentic love. When we choose vulnerability, we put our well-being in someone else’s hands. Becoming vulnerable not only requires lowering our defenses–it requires us to completely lay them aside, to open ourselves up to the possibility of being wounded. One way we can be wounded in our vulnerability comes in the form of rejection. I don’t know about you, but there is little else that has wounded me as deeply as being rejected for who I am. The pain is deep, and when we’ve experienced it once, we become wary of putting ourselves in any position where it could happen again. Choosing to love the way that Jesus calls us to love requires a willing vulnerability. A vulnerability that is keenly aware of the potential for rejection–but chooses to love anyway. Jesus stood in the gap for these two–and so many others that we meet on the pages of Scripture. He put Himself in vulnerable positions over and over and over again to align Himself with those who were even more vulnerable in society. He willingly stepped into situations where He would find Himself accused, mocked, rejected, hated. And He tells us to love others in the very same way. He asks us to lay down our defenses and stand in the gap in the name of loving one another, loving our neighbor. And our neighbor is everyone. Everyone that bears the image of God. Back in Jerusalem he tried to join the disciples, but they were all afraid of him. They didn’t trust him one bit. Then Barnabas took him under his wing. He introduced him to the apostles and stood up for him, told them how Saul had seen and spoken to the Master on the Damascus Road and how in Damascus itself he had laid his life on the line with his bold preaching in Jesus’ name. After that he was accepted as one of them, going in and out of Jerusalem with no questions asked, uninhibited as he preached in the Master’s name. Saul had arrested, persecuted and sanctioned the murder of countless Jesus followers. He had a past. People were afraid of him-so much so, that many were unwilling to give him a chance. This is what he faced when he came to Jerusalem. His reputation preceded him. What would have happened if Barnabas had been unwilling to be vulnerable, unwilling to risk his own reputation to vouch for Saul? Thankfully, we’ll never know. Because after Barnabas spoke up and stood in the gap for Saul (who would become Paul), Saul was “accepted as one of them” and he went on to plant churches and preach the Kingdom of Heaven and write a massive portion of our New Testament. All because someone was willing to oppose popular opinion. Ron’s question–Why is it so hard to love? My answer–Because it’s stinking hard! Loving God’s way is impossible apart from the Spirit of God. God’s very essence is love, so in order to be able to have godly love, His essence, His character must dwell in me, and in order for His character to dwell in me, I must be filled with Him. How I would love to say that I live this way consistently–but I can’t. I sometimes ponder, if my life was summed up in a couple of phrases–would full of the Holy Spirit be one of them? Full of the Holy Spirit indicates full of love. None of the verses Ron used in his sermon were unfamiliar, none of the verses Laura references above are unfamiliar, “God is love” is not unfamiliar. We know this in our heads, but living it out in our lives becomes intrinsically more difficult. When Ron talked about the way Jesus loved Judas, even knowing that Judas was going to betray him, it pierced my heart. I pray for God’s love to reach members of ISIS, of world leaders, of human traffickers, but Jesus shared life with Judas, shared bread with Judas, didn’t talk negatively about him to the other disciples. He loved him. And I feel sure, if Judas hadn’t taken his own life, that Jesus would have gone to him after his resurrection and loved him then too–just like He did with Peter. It’s the close proximity people who challenge my loving well. If I think someone might hurt me, my self-protective barrier goes up, my wall goes up–and that’s not loving the Jesus way. I think there’s an important nugget for us in the story of Judas. Luke 22:3 makes it clear that “Satan entered Judas”, but what made Judas susceptible to that attack? Was it a love of money? Was it frustration that Jesus was not setting up an earthly kingdom? Was he mad about not being part of the inner circle of Peter, James, and John? We don’t know. What we do know is that he separated himself from the rest of the disciples for a time. What were the disciples doing that day? Preparing for the Passover. What was Judas doing? Visiting with the Chief Priest and coming up with a betrayal plan, which ultimately destroyed his own life. Here’s the nugget. We have got to guard our hearts fiercely! We have to stay connected to the body of Christ. We must be willing to ask the Holy Spirit to search us daily, and confess those areas that don’t line up with God’s desire, and we have to choose to love. We have an enemy who is seeking people to devour (1 Peter 5:8), and the moment we let our guard down, we are susceptible to all kinds of destructive things. Unfortunately, I know this from personal experience. So, how do we choose love? How do we truly love God and love others–even our enemies? I once sat across the table from a man who was going to lead a student conference for us in Brazil. While we were discussing things, he said something that I’ve never forgotten. He said that we are not capable of loving God the way God wants to be loved, so we must ask the Holy Spirit to help us love God well–to love Himself through us. Think about that for a second. Have you ever asked God to love Himself through you? I never had, but I think this man is right. God makes it clear that He loves us. Responding to that love with love is where it all begins–and it’s a Spirit thing…the fruit of the Spirit is love…. (Gal 5:22) . So how does it happen? No doubt, there is mystery involved, but God tells us that we receive the Spirit of Christ when we receive Christ (Romans 8:9). We learn that the Spirit can be quenched (1st Th. 5;19) that He can be grieved (Eph 4:30), that we can ask for Him (Luke 11:13), and that being filled with the Spirit (Eph 5:18) is what we are to be about. And the evidence that we are filled goes back to Galatians 5:22–His fruit will be evident in our lives, it will be the natural outflow–and Jesus tells his followers in Luke 6:43-45 and Matthew 7:15-19 that we will be recognized as His followers, or not, by our fruit. Paul tells us, in the famous “love” chapter (1st Corinthians 13) that it is possible for us to do all kinds of things, like speak in tongues, prophesy, fathom mysteries and knowledge, have faith that moves mountains, give everything we have to the poor, allow ourselves to go through hardship but if we have not love…we are nothing. 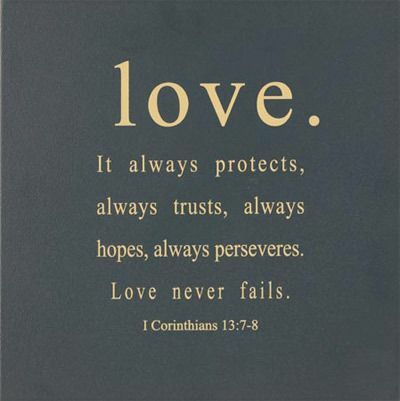 Then Paul describes what love in action looks like–patient, kind, not envious, not boastful, not proud, not dishonoring, not self-seeking, not easily angered, keeps no record of wrongs, doesn’t delight in evil, rejoices with truth, always protects, always trusts, always hopes, always perseveres, – love never fails. Do we believe this to be true? Are we willing to step out of the self-righteous, hate spewing, grudge bearing culture that we live in–humble ourselves, choose the Jesus way, and let Him love through us, even if it costs us dearly? Holy Spirit, we need your help! In this day of division, labels, hate, vitriolic comments, may we, Your people, choose a different way by choosing to allow you to fill us and choosing to allow You to love others through us–all others. Your love is the only thing that will change this world. May we allow you to change us, and use us to love others well. This entry was tagged choices, Rejection, Relationships, Vulnerability. Bookmark the permalink.